Your chance to win a iFi xDSD DAC worth £399! KEF's new Reference series floorstander gets Noel Keywood's attention. Jon Myles checks out new 'speakers from a company that always excites. This loudspeaker talks to you. Jon Myles listens. The latest high-end DAC from UK mega-experts. Noel Keywood listens. A one-million tap digital filter. Noel Keywood explains. Martin Pipe tackles a budget combo. Jon Myles listens to a loudspeaker and interconnect cable that is truly high-end, in price and performance. What is Roon? Noel Keywood explains and gives a user experience of this music cataloging and distribution software. Martin Pipe looks at an old fave DAC. A revived automatic vinyl spinner from German Dual. Noel Keywood takes it easy. Martin Pipe checks out a new discrete transistor phono stage from vinyl specialist Pro-ject. The final days of EMI. Paul Rigby reviews a book on the great company's downfall. Your chance to win a Quad Artera Play+ CD player worth £1,195. 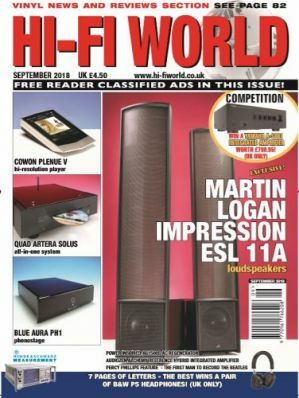 Elegant floorstanding loudspeakers from Italy, reviewed by Noel Keywood. 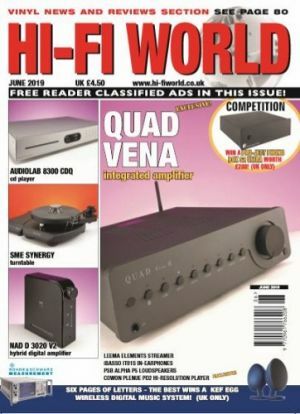 A new amplifier / streamer from Micromega of France, reviewed by Martin Pipe. Jon Myles checks out Melco’s audiophile N100 storage drive – and their D100 CD drive that delivers high quality rip files. The classic 300B valve in a newly updated amplifier. Noel Keywood takes a close look. 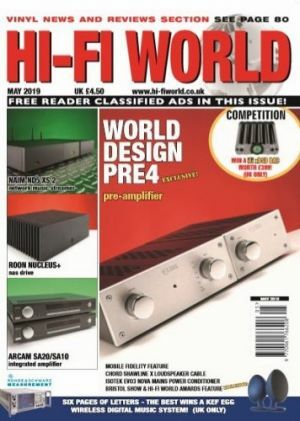 A new pre/power combo designed and built in the UK reviewed by Martin Pipe. Icon Audio have designed and had produced an all-new valve, the KT150 D. It is a triode replacement for the KT150 tetrode. Noel Keywood looks closely at what lies behind this unique new tube. Long, long ago during the 1970s Quadraphonics appeared - surround-sound from LP. An early entrant was Pioneer's QX4000 receiver. Martin Pipe harks back to old technologies. Hanna (Japan) release two new moving coil pickup cartridges, both with advanced Microline stylus profile. Noel Keywood spins vinyl to see how they fare. My Generation – a book of pictures from they heyday of Rock, reviewed by Paul Rigby. amplifier and Russ Andrews Supplier worth over £900. B&W recently launched a new range of budget loudspeakers. 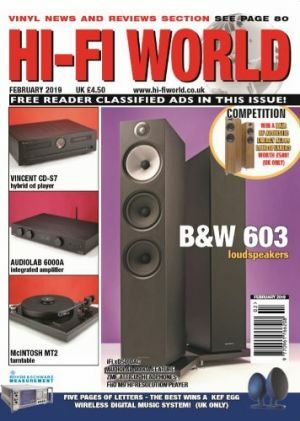 Noel Keywood reviews the top 603 floorstander. A high resolution portable player that does it all. Packed with facilities, Noel Keywood gets involved. A CD player with a complex valve output stage. Noel Keywood loves the sound. Audiolab come up with a super-affordable amplifier, fitted with digital input and Bluetooth. Jon Myles is impressed. 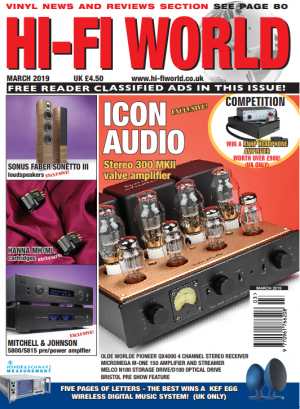 Martin Pipe talks about woods and their sound in this review of esoteric headphones. 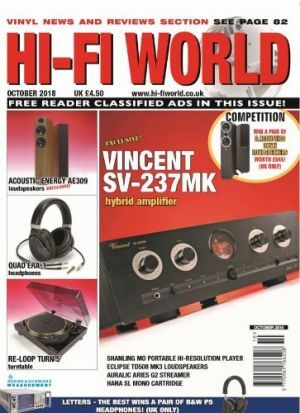 Martin Pipe looks at a classic amplifier now available cheap at your local car boot sale. A vinyl spinner that glows gorgeous green – styled for a McIntosh system. Noel Keywood looks closely. Feet that make a difference. Paul Rigby explains. Ripped & Torn. A compendium of the short lived punk magazine, reviewed by Paul Rigby. Your chance to win a pair of Acoustic Energy AE109 loudspeakers worth £500. The Police and Zenyatta Mondatta – a classic album explained by music expert Paul Rigby. hi-res – but good all the same. Top loudspeaker cables – reviewed by Jon Myles. 'Evenings with Led Zeppelin', a concert catalogue and more of the great band reviewed by Paul Rigby. Paul Rigby gets to grips with a new LP cleaning machine from the U.S. Some products stand-out, offering great sound in a product we'd like to own. Here are our top products from 2018 – those with something special. You know about high fidelity? Here's a head-scratcher for Christmas – answer it whilst the turkey is roasting! Your chance to win an Onkyo TX-RZ830 A/V receiver worth £1100. 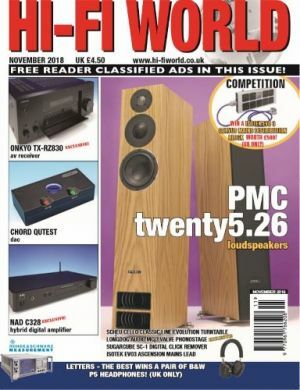 Jon Myles and Noel Keywood check out PMC's twenty5.26 loudspeaker. Martin Pipe looks at an AV receiver of enormous complexity and ability. The latest DAC from Chord Electronics, reviewed by Martin Pipe. Jon Myles is impressed by this small digital amplifier. Martin Pipe checks out a new mains lead from Isotek. Linn hold a major product launch. Martin Pipe brings you the details. Now available for little second hand, this complex AV unit still offers quality explains Martin Pipe. A finely engineered and great sounding turntable makes Noel Keywood tie the knot. Want to get your turntable running properly? Noel Keywood explains how. Paul Rigby reads a new book on artists' first-time experiences, by author Matt Everitt. Noel Keywood listens to an MC phono stage that uses both jfets and valves. Remove clicks from LP the digital way with this fascinating box of tricks from California, reviewed by Noel Keywood. Your chance to win a EVO 3 Corvus mains distribution box worth £500. Floorstanders with a fast, punchy sound, noel keywood finds. Small and elegant, martin pipe enjoys these sophisticated minis. Complex – but a finely honed streamer. Martin pipe explains. A miniature hi-resolution portable player wows noel keywood. This hybrid amplifier delivers wonderful sound quality. Paul rigby looks at intriguing accessories. Martin pipe looks back at recording to cd. 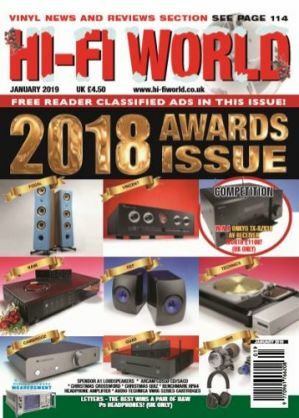 Paul rigby reviews hi-end loudspeaker cables. A quality mains cable impresses paul rigby. Paul rigby's salute to an original rocker. Details of a forthcoming london show. Don't miss it – or us at it! 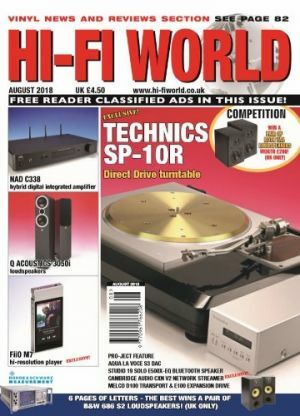 A modern direct drive turntable package reviewed by noel keywood. Hana's sl mono mc cartridge for old classic lps, by paul rigby. Noel keywood on how to play mono. Tangerine dream: force majeure, by paul rigby. Magnetic planar headphones from quad reviewed by noel keywood. A complete system for £1500 that wows Jon Myles. 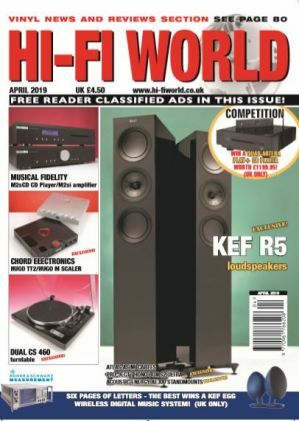 Noel Keywood covers a "left field" topic of hi-fi – producing clean mains power. Your chance to win a Yamaha A-S801 Integrated amplifier worth £799.95. Powerful bass and a smooth delivery; Jon Myles loved 'em. Jon Myles listens to a small, budget power tower 'speaker. A fine portable with VHF/FM – just £150. Noel Keywood tunes in. Martin Pipe returns to an old favourite in updated form. Jon Myles checks out new top digital drives from Melco. A specialised ladder DAC takes Martin Pipe's fancy. NAD do budget digital with flair, Jon Myles finds. – and learns about HD Vinyl too. Martin Pipe goes back in time to an early Meridian CD two-box player. A £9k reference turntable; listen up. Noel Keywood does – closely. AUDIOPHILE BOOK – of course i said yes! Paul Rigby looks at The Amazing Adventure Of A Life In Music. The latest and greatest hi-fi hardware on sale. Manfred Mann - Mann Made. A classic even though the band thought not, says Paul Rigby.